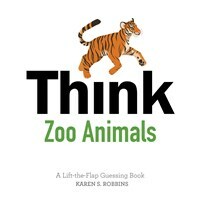 Think Zoo Animals combines two things toddlers and preschoolers love—guessing games and animals—to help them learn analytical thinking skills. Its ten flaps are designed with circular die-cut shapes that give clues to the wild animals hidden beneath. Children are invited to listen to the clues, guess the animal, and then lift the flap to see what it is. This delightful, interactive board book and its adorable drawings will provide hours of fun while helping kids increase their knowledge, language, reading, and fine motor skills. Karen Robbins is an award-winning children's author with more than 300,000 copies of books in print. Rachael Brunson holds a BFA from Northwest College of Art and Design and lives in Gig Harbor, Washington.